Empire Live have recently added three new exclusive events to their list. So not only will it be held at London's prestigious O2 Arena, running from Friday the 23rd of September to Sunday the 25th of September, 2016, but on top of that, they have event's so fantastic, they may actually take you to the moon and back. The first of these announcements involve a preview screening of John Michael McDonagh’s 2016 comedy, War On Everyone. Essentially it's a story that follows the jovial exploits of two corrupt cops in Albuquerque, played by Alexander Skarsgård (True Blood) and Michael Peña (End Of Watch). This is the third movie directed by John, and from the looks of it, its going to get the five star treatment like his previous two did. Second on the list is an extended version of Ridley Scott’s The Martian. As most of us know, it stars Matt Damon who plays an astronaut that get's stranded on the moon. Since it's initial release this film has won two Golden Globe Awards and a Jameson Empire Award, the last of which was awarded to Damon for being Jameson's Best Actor. 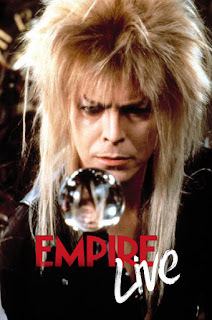 And last, but not least, there will be a tribute to the late, great, Ziggy Stardust himself, David Bowie. Empire Live will host a special screening of his 1986 film, Labyrinth, which will be followed by a Q&A with the conceptual designers and puppet-builders, Brian and Wendy Froud. Basically the film sees Jennifer Connelly plunged into a magical labyrinth and given 13 hours to rescue her baby brother, who’s been kidnapped by Jareth, the Goblin King. Audience members are invited to come in costume fit for Jareth’s masquerade ball. Now these three latest additions have joined an already confirmed special presentation of Richard Linklater’s most recent comedy, Everybody Wants Some! !, as well as a series of screenings in partnership with The Criterion Collection, accompanied by a live version of the award-winning Empire Film Podcast. Further screenings and events will soon be revealed, with the full roster of events promising to include first-look screenings of some of this year’s most anticipated releases, specially curated bills, movie masterclasses, pop-up parties, and more-more-more. Terri White, Editor-in-Chief of EMPIRE magazine, said: “The countdown is now firmly on to the biggest and best film and entertainment weekend anywhere in the world. The combination of a big-screen tribute to Bowie, previously unseen footage from The Martian, and the first chance to see one of this year's most hotly-anticipated films, War on Everyone, is just a small taste of the wonderful programming all film-lovers can enjoy this September”. Ticket packages and further information is available from the official Empire Live website and twitter pages.